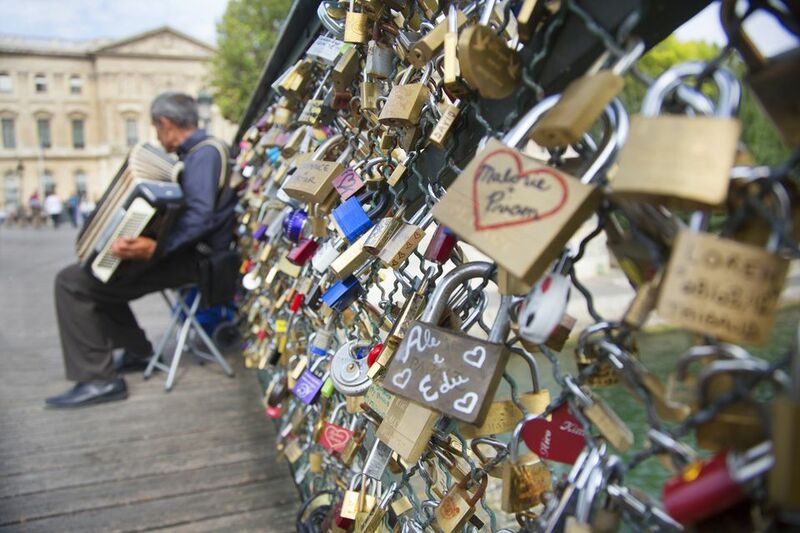 Paris is reputed as the city for lovers par excellence, and for good reason. There seems to be built-in romance everywhere you turn, from poetic parks and gardens to breathtaking panoramas and world-class restaurants. All these elements can combine to make for a truly romantic experience. No wonder so many couples choose the capital for a destination honeymoon or anniversary trip. Coming to Paris on or around Valentine's Day can be truly idyllic, but no matter when you come for a jaunt in the city of light, making a special time of it is easy. With so many romantic Paris attractions to choose from, your only problem will be deciding where to start. Click through for tons of ideas. It's free, easy, and très romantique: a twilight or evening stroll in some of Paris' most romantic places to walk is guaranteed to be a memorable experience. No wonder so many squeaky-clean romantic comedies show lovers wandering Paris. Paris is filled with top-rate romantic restaurants. Assuming that you reserve ahead and avoid overly-noisy or crowded restaurants, dinner for two is definitely in order. Whatever your budget and tastes, there are plenty of options, from Michelin-starred tables to quiet, unassuming bistros serving authentic French cuisine. You can even dine in the dark, getting to know each other in a whole new way! Imagine overlooking the entire city of light with someone you love. Paris affords several great spots for romantic panoramic views. Some of them are even free. Climb to the top of the Eiffel Tower for breathtaking views. You can also have a romantic dinner at one of the tower's restaurants. Wonderful views can be had from the Sacre-Coeur viewpoint area in Montmartre. Take the funicular up for a unique experience. The Centre Georges Pompidou has a rooftop terrace and restaurant, Chez Georges, that affords gorgeous views of Paris' main landmarks. Access is free with a museum ticket. Renowned for its excellent performing arts scene, Paris is an ideal destination for a romantic night of music or theater. If you're both learning French, what could be more stimulating than seeing a play in French and then decrypting it together afterward? For non-French speakers, not to worry-- many shows require only a love for the arts. What could be more idyllic than floating down the Seine in a lazy cruise boat, hand in hand with someone special? Paris boat tours are a fantastic way to see the city in a relaxed, picturesque light, and a great pretext for cozying up. For something more unusual, try taking a tour of Paris canals and underground waterways. For an especially romantic evening out that includes sparkling lights on the water, fine dining and unforgettable views of some of the city's most iconic places, we definitely recommend booking a dinner cruise. For couples who share a passion for great movies, Paris is a great place to spend an evening at an old movie. The city of light is a cinephile's dream and has lots of fantastic places for celluloid, so try one of Paris' best movie theaters before or after dinner. Something about these charming theaters evokes a kind of old-school romance that's hard to come by these days. In the summer, open-air screenings of classic and contemporary films at the Parc de la Villette can be a great excuse for cuddling up on a blanket under the stars. If you're both literature fans, why not take our self-guided tour to some of the most famous literary haunts in Paris? These places frequented by the likes of Oscar Wilde, Colette, and Hemingway ooze with both style and romance.